St. Supery, located in Napa Valley, in the Rutherford AVA was first purchased by the Skalli family in 1982. While their first foray into the Napa Valley was relatively recent, the Skalli family has been involved in the wine industry since 1920. They started out producing wine in Algeria before expanding into Corsica with the Terra Vecchia winery in 1961, and then later into Northern California. At the time of the original purchase of Saint Supery, the large estate included 1,530 acres in the Napa Valley. While much of that land was used for cattle ranching, the deal included 500 acres of fully cultivated vineyards. Those vines are where they get the fruit for their Dollarhide Estate Vineyard wines today. The Dollarhide vineyards ranges in elevations from 600 to 1,100 feet. The vineyards are planted to all the major Bordeaux varietals. 3 years later, in 1985, under the direction of Robert Skalli, they added 56 more acres of vines located in the Rutherford appellation. The alluvial soils, with sand, clay and loam are planted with red wine, Bordeaux varieties. In time, that purchase became their new headquarters. 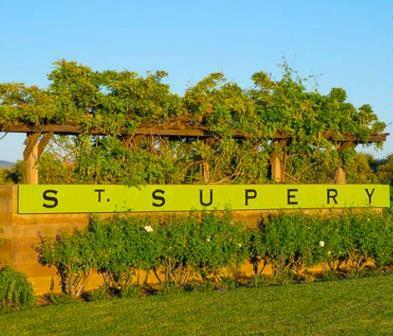 After years of construction, St. Supery officially opened their new winery in 1989. St. Supery is committed to self sustainable vineyard techniques and using solar generated power when possible for all their vineyards and winery operations. They were one of the first estates in the Napa Valley to use optical sorting technology. For a period time, St. Supery brought in Michel Rolland to consult on their wine making and vineyard management. He has since left the estate. Today, St. Supery produces a plethora of popular wines including Cabernet Sauvignon, Cabernet Franc, Merlot, Malbec and Petit Verdot and various Bordeaux blends as well as white wines from Chardonnay, Semillon and Sauvignon Blanc grapes. St. Supery wines are best served at 15.5 degrees Celsius, 60 degrees Fahrenheit. The cool, almost cellar temperature gives the wine more freshness and lift. Young vintages of their red wine can be decanted for 1-3 hours, depending on the character of the vintage. This allows the wine to soften and open its perfume. Older vintages might need very little decanting, just enough to remove the sediment. The red wine of St. Supery is best served with all types of classic meat dishes, veal, pork, beef, lamb, duck, game, roast chicken, ribs, hamburgers, barbecue, roasted, braised, grilled dishes and stews. St. Supery is also good with Asian dishes, hearty fish courses like tuna, salmon, mushrooms and pasta. The white wine of St. Supery is best served with all types of seafood and shellfish, sushi, sashimi, chicken, veal, pork and cheese. In late 2015, St. Supery was sold to the Chanel Group. The Chanel Group is well versed in running wineries as they own two leading chateau in Bordeaux, Rauzan Segla, a Second Growth in the Margaux appellation and Chateau Canon, Premier Grand Cru Classe in St. Emilion. It is expected that the team already in place that is in charge of the production, sales and distribution of the wines from St. Supery will remain in place. The 2015 harvest has just finished in the Napa Valley and in Bordeaux. While the vintage is thought to be of good quality in California, the yields were small. In Bordeaux, 2015 is already being talked about as being of very high quality. It will be interesting to see how this purchase becomes incorporated into the other wine and winery assets owned by the Chanel Group. For example, the Chanel group owns a large Bordeaux Negociant, Ulysse Cazabonne. With this obvious symmetry, it’s possible that this will lead to the availability of St. Supery wines for sale on the Place de Bordeaux. That could be a great decision as that would only lead to more international recognition to the St. Supery brand. Medium bodied, very fresh and with a strong lean to the lemon, grapefruit and crisp citrus side of the style range. This would make a nice, around the pool, refreshing, summer wine. Medium/full bodied, soft, polished, forward in style, with sweet, ripe, red and black plums, dusty tannins and a blend of cherry and cassis in the open finish. Medium bodied, with a soft, forward, open character, leaning to the bright, red berry side of the style range. You should be able to enjoy this on release. Ripe, with loads of fresh juicy, sweet, dark, red fruits, with soft tannin and fleshy, round textures. This is already delicious and ready to go. Medium bodied, forward, soft and sweet, with dark red fruits, earth, spice and just a hint of vanilla, the wine is classic in nature and ready for its prime time drinking window. The wine was made from a blend that would be at home in the Left Bank of Bordeaux, with 65% Cabernet Sauvignon, 22% Merlot, 9% Malbec, 2% Cabernet Franc, 2% Petit Verdot. Blending dark red, black and blue fruits, with soft, round textures and a soft, polished finish. This almost 100% Cabernet Franc exchanges power for flesh and freshness. A blend of Bordeaux, with its freshness, ripe cassis, juicy blackberries, thyme, smoke and oak. Medium/full bodied, with a softness to the tannins, this is a nice wine. Ripe, juicy dark fruits, licorice and vanilla. Round, soft, easy to drink with a lush, chocolate covered, black cherry finish. Forward, round, plush, fat, juicy and fruity, this is ready for immediate pleasurable drinking. Spice, herbs, earth and espresso notes add to the ripe, fresh, plum and black cherry notes in this medium bodied, forward wine. Medium/full bodied, earthy red and black fruit notes, with freshness in the mouth and an oaky, ripe, round, fruity finish. Medium bodied, fresh, bright, crisp black cherry and black raspberry fruits mix with a blast of espresso and cocoa in this forward, soft, early drinking Merlot. Forward, full bodied, concentrated and ready for prime time drinking. The chocolate covered black cherries, licorice, vanilla and coffee character is shining. The round, polished textures and sweet, lush, ripe fruits in the finish seal the deal. The wine was made from a blend of 77% Cabernet Sauvignon, 13% Merlot, 8% Petit Verdot and 2% Cabernet Franc.